That such a “minor” thing as trust can have such a devastating impact on commerce and society will come as no surprise to anyone who has studied the ideals of chivalry. Trust, truthfulness and fidelity were among the most valued qualities of a knight – in a world where written words were scarce, a knight’s “word of honor” was perhaps the most valuable measure of character. Shakespeare called this “the bubble reputation” – a reminder that the good name a knight built was a fragile thing that needed to be carefully guarded. Today’s corporate entities and government agencies could learn a thing or two about the value of trust – and the challenges of “trust building” – from those medieval practitioners of chivalry. Lie to the people who trust you at your own peril … one gust of an ill wind is all it takes to burst the bubble reputation once and for all. 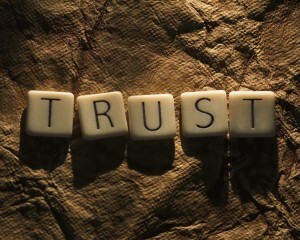 In this piece, reprinted from the Trust Advisor blog by business author and consultant Charles H. Green, Peter Firestein (author of Crisis of Character: Building Corporate Reputation in the Age of Skepticism) talks about the importance of trust in business, particularly in a time of economic troubles and low consumer confidence. Charles H. Green: One thing that struck me (in the book Crisis of Character) was the insistence on reputation as being built inside out: the only sensible strategy is to be the company you want your stakeholders to see. Peter Firestein: One of the book’s early titles was “The Glass House,” meaning, of course, that you can’t fake things for very long any more. Just thinking about the failed obfuscations attempted by some big corporations in recent years can bring actual, physical pain. When I say you have to “build reputation from the inside out,” I mean that managers have to create reporting and communications structures that not only disseminate values throughout the organization, but absorb the workforce’s on-the-ground experience all the way to the top. Every action the company takes, therefore, represents its core value system. And the workforce’s day-to-day reality informs senior decision-making. I call this “vertical communication,” and I think it reduces the likelihood that a CEO will wake up some day to find that a regional manager has been found to have bribed a government official, or a sub-contracted factory is discriminating against female employees, or an accidental dump of toxic waste has disappeared from company records somewhere down the line. There are few small failures in big business. In fact, the depth of failure often presents a mirror image of success that preceded it. True vertical communication that extends throughout the organization helps you spend your life thinking about other things. CHG: (H)ow you see the relationship between trust and reputation? PF: If there’s a difference between high trust and strong reputation, I’m blind to it. Both trust and reputation—whether high or low—are expectations of future experience based on what is known about the past. That’s how people differ from markets. The legal disclaimer on any financial offering warns that past performance does not indicate future results. With human beings, it generally does. CHG: You provide a very real-world example of exactly how a big company should go about recovering from a reputational slip, and what impressed me about it was your recommendation of aggressive, pro-active engagement. Say more about that? PF: Here’s how pro-active you ought to be. You start preparing for the next crisis five years before it happens. And you don’t need a crystal ball for this. If you’re a multi-national company of scale, it’s impossible to avoid reputational mishaps. Some day, somewhere, someone will—intentionally or by neglect—commit a reputation-compromising act in your name. The inevitability must be an integral part of your thinking. So, you have to have a culture in place well in advance that enables you to respond appropriately to events that never crossed your mind before they happened. People call it crisis communications, but it’s much more than that. Communications, by itself, never fixed anything. People also call it crisis management. But the crisis has already occurred, so the opportunity to manage it is past. You could call it management of the aftermath, and the only way to manage the aftermath effectively is to participate in it. Which means, to some degree, participating in the emotions of those you have harmed. Referring to a person in the CEO position, the corporation becomes the person, and vice versa. If, as an individual, you have empathy toward a family who’s lost a father or a mother, you have to show that same empathy as a corporation. Read the full interview with Peter Firestein, along with several other interviews on trust in business in the Trusted Advisor blog, written by Charles H. Green.